Located centrally in the heart of the Thamel neighborhood, the recently renovated Hotel Potala is a relaxing, friendly, convenient, and safe place to stay. A range of room options, from deluxe double rooms with TV and private bathrooms to rooms with shared bathrooms, makes it ideal for individual travelers, trekkers, or families. Each room is tastefully furnished with carpeting, has hot water 24 hours a day, and has a ceiling fan. A rooftop garden provides great views of the Kathmandu valley and Swayambhunath (the "monkey temple"), and our restaurant near the lobby serves Nepali, Indian, Chinese, and Western dishes throughout the day. Our family has over a decade of experience in the hotel business, and we wish to make you feel like you are in our home rather than our hotel. Let us know how we can make your stay more comfortable and enjoyable! We can book trekking trips and tours to the areas surrounding Kathmandu. 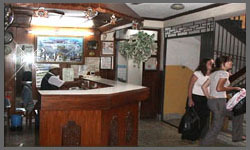 Our other guest services include laundry service, safe boxes, a small internet café, guest car parking, 24 hour check in, no curfew, night security service, a lounge area with TV, and luggage storage.